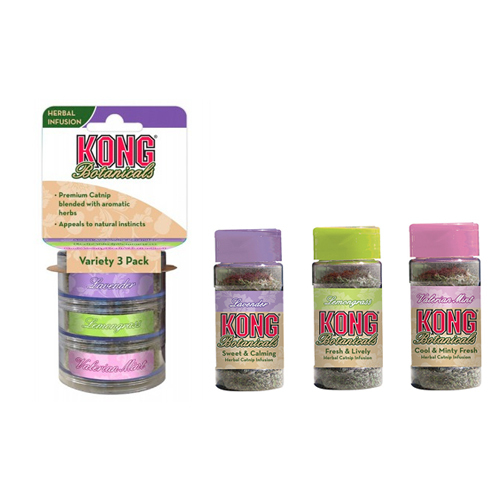 KONG Botanicals combines premium North American catnip with aromatic herbs. There are three different types of catnip in the KONG Botanicals range: lavender and lemon grass. You can use KONG Catnip Botanicals separately or use it in one of the refillable KONG cat toys. Catnip is a stimulant for cats, as it contains the stimulating compound nepetalactone. Catnip is safe for your cat; it does not contain any harmful substances. KONG Botanicals combines premium North American catnip with aromatic herbs, making it even more attractive for your cat. There are 2 different kinds of catnip in the KONG Botanicals range: lavender and lemon grass. You can use KONG Catnip Botanicals separately or use it in one of the KONG refillable cat toys. Have you used KONG Cat - Catnip Botanicals before? Let us know what you think about this product.